While games only made up 6% of the startups, they actually represent a relatively mature sector here. I was surprised by the number of content startups, given the relative dearth of a reading-blogging culture locally. Only 14% of startups offered (physical) goods, of which only a handful were genuine hardware startups. This seems low given Hong Kong’s proximity to Shenzhen and history of toy/clothing manufacturing. 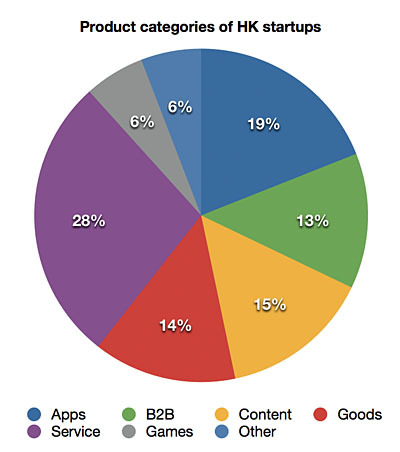 45 startups (35%) offered free (or freemium) products/services. Productivity tools were nowhere to be found. China-targeting startups were rare (probably less than 10%), which either speaks to the difficulty of doing that from Hong Kong or a lack of trying. Want to find out more? See the four startups we chose to feature on Startup Hug or see the updated list of startups at We Are HK Tech.